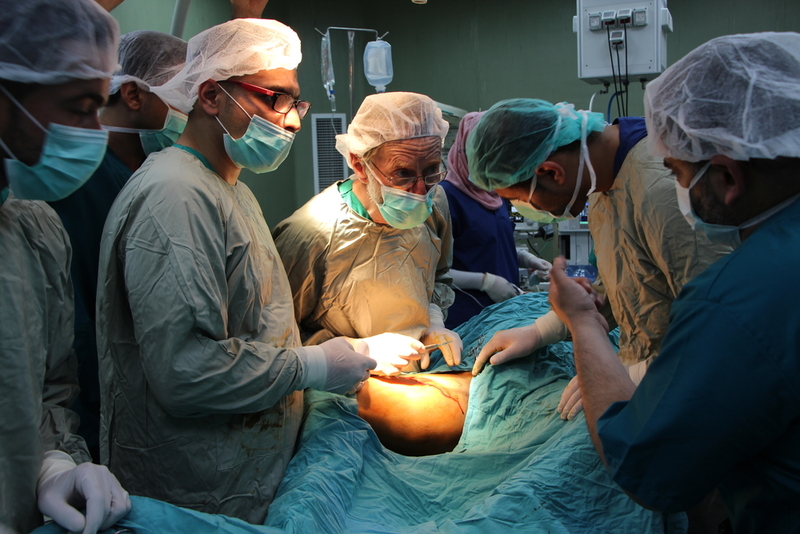 Thierry Saucier is an orthopedic surgeon working with MSF in Gaza. He explains the complexity of caring for the hundreds of people injured during the March of Return demonstrations in recent weeks. Very serious injuries pose significant challenges for the surgeons, and will require months or even years of care. "We are mostly seeing bullet wounds. In more than 95 percent of cases, bullet wounds are in the lower limbs, including knees. We also find some gunshot wounds to the abdomen and upper limbs. What is most notable, in the patients we have seen in the last three weeks, are the exit wounds of the bullets. When a bullet passes through a body, it always has an exit wound slightly wider than that the entry one. But in the patients we treat in our post-operative care clinics, the exit wound gives an indication of the unusual destruction of soft tissues and bones inside the wound. The exit wound is disproportionately wider. It can be the size of a fist, or even of an open hand. These extreme lesions are obviously difficult to repair and often require subsequent grafts. In half of the injured we’ve received, the bullet has reached the bone, causing multi-fragment fractures, which means the bone has literally been turned into dust. The bullets also cause multiple and irregular tears in the soft tissues (skin, tendons, muscles, nerves, arteries). This leads to devascularisation, which is to say that the blood flow doesn’t reach these tissues anymore, which in turn creates high risks of infections. If the bullet touches the sciatic nerve, it causes paralysis – which can be irreversible – as the repair of the lesions cannot be done in an emergency setting. When it is an arterial lesion, we face an immediate life-threatening risk, as well as a devitalisation of the limbs, and therefore often an amputation. As injuries are very severe, the tissues are often difficult to recognise within the wound. Sometimes they are just not there, carried away by the bullet. We cannot always recognise the normal anatomical order, as the features we look for are no longer present. "The functional prognosis is very serious in all the patients we have seen. These injuries are undeniably destructive for the lives of wounded." We have to incise, upstream or downstream of the wound, to find the base of a nerve, a tendon, a blood vessel. This is similar to surgeries that are conducted on war wounds. Surgery is extremely complex to perform and operations can last several hours. They are also complicated by the lack of certain materials and equipment. Today, only one hospital in Gaza has the necessary equipment for skin grafts and I came with my own microsurgery kit, including sutures and magnifying glasses. The teams we work with at Al-Aqsa and Al-Shifa hospitals are qualified teams, with whom we have good collaboration. First, the risk of complications, especially infections, is very high for these types of injuries. There is also a risk of loss of substance – when a bone which has been destroyed by a bullet is growing back, it always becomes shorter than that of the other limb. Second, although patients are stabilised through emergency operations, most will require additional operations. And of course there will be months, or even years, of rehabilitation. The majority of the wounded, those whose bones, joints, nerves and arteries have been hit by bullets, will have certain side effects and conditions as a result of these injuries for the rest of their lives. These can include shortening limbs due to fractures; stiffness due to joint injuries; paralysis for injuries involving nerves; and vascular distress for arterial wounds, sometimes requiring subsequent amputations.